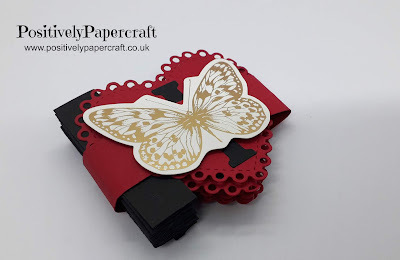 Fun Pull Out Accordion Style Card! So i wanted to share this cool pull out accordion style card with you. I have seen them around and thought they looked pretty cool. As Valentines Day is getting closer, i thought i would make it in a Valentines theme. When you open it out, it says 'I love you', how sweet. I love the Red & Black and it looks very striking. I hope you like it to. It all folds in and is kept together with a belly band. I had a lovely pack of gold foil ephemera so i glued a Butterfly on the front of the Belly Band. I think the Gold & White goes so well with the Red & Black. Its really simple to make and you can use any shapes you like. Hearts, squares, circles etc. You could also spell out Birthday or anything you like, maybe someones name. BLACK CARD MEASURING 11 3/4" X 2 3/4"
SCORE THE LONG SIDE @ EVERY 3/4"
BELLY BAND MEASURES 1" X 8 1/4"
I have had a few people asking me where i got the Heart dies from. I bought them from THE WORKS but i have know idea if they are still available to purchase. I hope you will give this project a try and i will be back tomorrow with another project. I am loving your cards and wishing I could subscribe to your blog so that I never miss a blog post. Could you add that feature to your blog? I have Karen, its been there for a few years now. Its on the right hand side normally at the top of the blog. Such a beautiful card . . . I ordered my large letters but have to be patient for my girlfriend to come to Algiers . . .or me going to Paris!!! I will definitely try it!! Thanks Ann.